An award-winning patisserie chef has showed off her latest “eggscellent” talents to a treat! 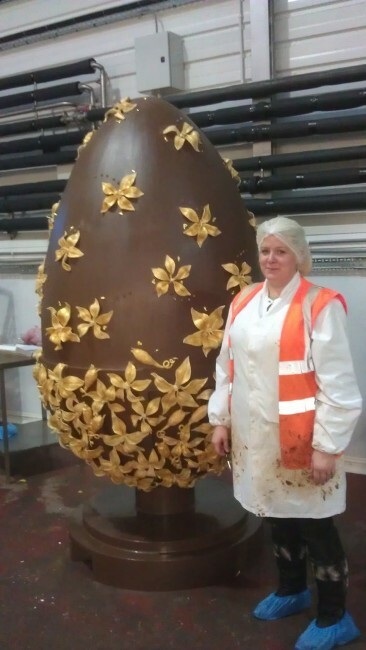 Charlotte Marrifield – who owns Sugar Therapy, a patisserie in Harrogate and also works for Lily O’Brien’s, Ireland’s renowned chocolate manufacturer – and was called on to decorate the largest chocolate egg ever made in the country. The 36-year-old travelled to the firm’s headquarters in County Kildare to cover the 2.4 metre high egg with more than 300 white chocolate gold leaf handmade lilies. The egg weighed in at 880kg and was made to promote an Easter egg hunt around Dublin in aid of the Jack & Jill Children’s Foundation – a charity which provides care and support for children with severe neurological conditions. It was a great opportunity for me to put my skills to good use and help raise money for a very worthwhile cause. It took me 50 hours to complete the decoration of the egg and the final result was absolutely stunning. The egg was displayed in one of Dublin’s leading department stores ahead of the Easter egg hunt. Hailed as the ‘Damien Hirst of the Dessert world’, Charlotte not only runs her own business but designs and develops cakes and desserts for several UK leading supermarkets. She has previously shown her creative flair for dessert-making in 5-star hotels and Michelin-starred restaurants and has tempted the taste buds of famous chefs including Gordon Ramsey and Albert Roux. Easter’s a great time for a chocolate egg treat but the one I decorated might just be a bit too filling!